In this new stripped three-part special Dan Jones, Suzannah Lipscomb and Rob Bell take a fresh look at the Great Fire of London by walking the actual route the fire took across London, hour-by-hour, street-by-street and in the process uncover what really happened in Britain’s worst inferno. In this revelatory series Dan, Suzannah and Rob explore what really happened in the Great Fire of London. It was a catastrophe for Britain – the most devastating fire we have ever experienced. It destroyed almost every building inside London’s city walls and has burned its way into our national memory. 350 years on we have all heard of the Great Fire but what do we really know about the events of those four fateful days back in September 1666? 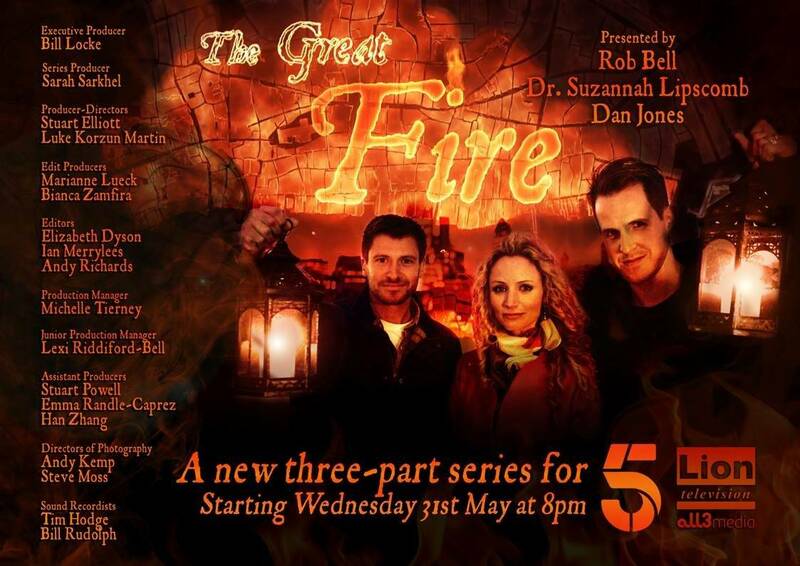 In this sensational three-part series, our three presenters – historians Dan Jones and Dr Suzannah Lipscomb, and engineer Rob Bell – use incredible new historical evidence and 21st century technology to investigate the story of the Great Fire as it really happened. Dan Jones walks the route of the fire, following its four day trail of devastation, street by street as it raged through the city, and discovers never before revealed evidence of its destructive power. Suzannah Lipscomb digs deep into archives and museum vaults to uncover the human scale of the tragedy, from the vast wealth that was lost to the flames, to how many people really died. Engineer Rob Bell explores, with the help of expert fire specialists and firefighters, why the fire became so deadly and what made it so unstoppable. Starting Wednesday 29th May 2017, 8pm, on Channel Five. For behind-the-scenes photos from the shoot, see Suzannah’s news page.